Beautiful summertime weather is ideal for taking your horse out for a ride. Although this is the perfect time of year for riding, it is important to keep your horse’s health in mind when taking him or her out in the heat and sun. To keep your riding buddy in top shape, keep these care tips in mind when riding your horse in the hot weather. 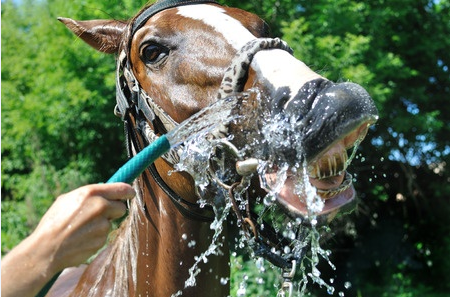 When you are hot, you crave cool water – and the same is true with your horse. Be sure to refresh your horse’s trough with clean water often – at least once a day – to keep the water from getting warm and stagnant. If you notice your horse is excessively sweating, try water with a proper dosage of electrolytes added to keep your horse’s body balanced. You may also want to keep a salt block nearby to help your horse replenish the salt they’ve lost from sweating. You can even mist your horse’s body with cool water from a sprayer during the exceptionally hot days to wick take away some of the heat and help with their natural sweating process. If possible, you should avoid working your horse if it is 95 degrees or warmer outside. Instead, ride or turnout your horse to pasture when it is cooler – nighttime hours or the early morning is ideal. If your horse must be outside during the heat, be sure there are plenty of shady spots. A run-in shed, like one from Deer Creek Structures, is an affordable and effective solution that can help your horse find respite on those sunny days. Both you and your horse can suffer from sunburn! Apply at least 30 SPF to potential trouble spots on a daily basis, or keep your horse away from the harmful rays by keeping him or her in a horse barn. You should take special care of white horses, white socks and blazers, pink noses and any hairless spots. If you notice a sunburn, it is important to consult with your vet to avoid infection. Although long hair can definitely protect your horse from the sun’s rays, it is important to clip longer coats to a proper length to avoid excess heating. Plus, it is important to keep your grooming brushes clean to avoid making your horse’s coat feel uncomfortable from dirt or debris. If you notice flies bothering your horse’s sensitive areas, try a fly sheet, fly mask or fly repellent to help keep your horse fly-free. Keep an eye on your horse’s behavior and be sure to involve your vet if you notice he or she has difficulty breathing or is dehydrated. Since heat stroke can come on suddenly, know the signs. They can include an elevated heart rate, too much or no sweating, high temperature, depression and dehydration. Ultimately, the best way to avoid horse sickness is to keep your horse inside during the day with a fan to help keep him or her cool. You’ll find a variety of horse shelters at affordable prices on Deer Creek Structure’s website. Need more help? No problem! Call us today at 254-546-2276 to discuss the best horse barn options for you.